Sophomore Kunho Kim always wanted to travel the U.S., but ensuring wheelchair accessibility at hotels, restaurants, and sightseeing attractions was especially hard. 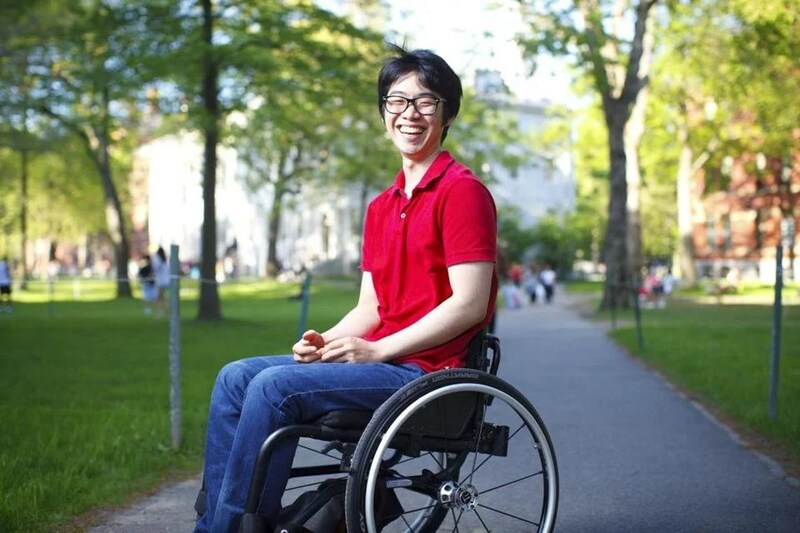 His friends Brad Riew ’17, Cynthia Cheung, and You-Myeong Kim ’17 got on board for the romance of the open road, and to gather accurate, reliable data for wheelchair travelers. Perhaps no single journey holds more mystical fascination for Americans than the cross-country road trip. Jack Kerouac, John Steinbeck, and Hunter S. Thompson famously wrote about the open road as a metaphor for personal and intellectual freedom and a vehicle for self-discovery and social commentary. And for decades, it’s been a summertime rite of passage, uniting everyone from families in station wagons to intrepid campers to vagabonds and outlaws, all eager to hit the pavement and experience the nation from sea to shining sea. Kunho Kim, a Harvard College sophomore raised in South Korea, knew that one of the things he absolutely had to do while living in Cambridge was travel around the nation. Brad Riew ’17, whom Kim met on his first day of freshman year during tug-of-war at Thayer House, got on board right away. The pair began planning their itinerary in earnest last spring, picking up two more like-minded travelers along the way: You-Myeong Kim (no relation) ’17, and Cynthia Cheung, a recent graduate of the University of Bath in England. Click here for a full rendering of the interactive map. But it wasn’t long before their plan ran into a snag. Kunho Kim has needed a wheelchair to get around since a ski-jumping accident in Montana in 2010 left him paralyzed from the waist down. While researching hotels, restaurants, and sightseeing attractions that would be accessible to him, it became clear that such information, if available at all, was surprisingly hard to find. Despite more than 20 years since the Americans with Disabilities Act (ADA) became law, if the information wasn’t buried deep in the back of guidebook and website listings, it was incomplete or used confusing terms. Frustrated, Kim and the group refocused their trip with a higher purpose: to gather accurate, reliable data for wheelchair travelers so others won’t have to slog through the same uncertain terrain or endure unexpected discomfort and inconvenience. On July 10, the group piled luggage, camping gear, a cooler, and Kim’s wheelchair into a rented Ford Expedition in San Francisco and began snaking across country, hitting 20 cities and three national parks, including Yosemite and the Grand Canyon, before pulling into in Cambridge on Aug. 24. 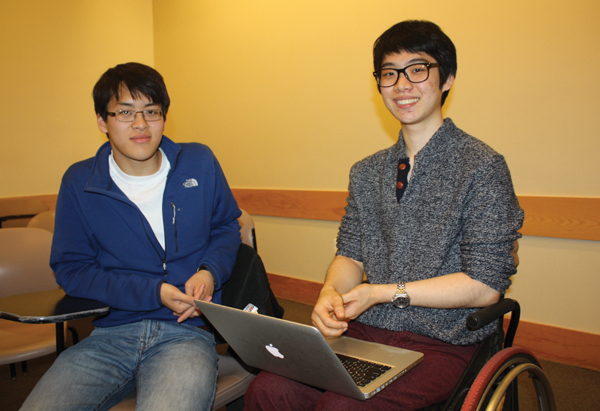 They created a blog called “Wheel Project 2014” about their trip and will use their findings to assemble a guidebook to wheelchair-friendly travel on a budget, to be published next year as part of Harvard Student Agencies’ “Let’s Go” travel series. According to U.S. Census data, about 3.6 million people over age 15 use a wheelchair; another 11.6 million require a cane, crutch, or walker to get around. Kim found that the accessibility information provided by hotels was often flat-out inaccurate, creating major headaches. Budget hotel websites that assured prospective guests that they had “roll-in” bathrooms frequently turned out to be misleading. Either the designated rooms were already booked when they checked in, or they were not truly accessible. “We asked a couple times, ‘Do you have a wheelchair-accessible bathroom?’ But once we get into the hotel, either they have a tub, or it’s not accessible and totally different from what we expected,” said Kim. “A lot of them aren’t practical. Sometimes they’ll be missing a bench, sometimes the railings would be far from the hand control, sometimes the shower nozzle would be so far apart that it would be impossible” to get wet, said You-Myeong Kim. To pay for the trip, the group raised just over $6,600 from families, friends, and other supporters through a crowd-funding website and received a grant from theChristopher & Dana Reeve Foundation, which funds research and advocacy for curing spinal-cord injuries. Now back at Currier House, Kim said that despite public awareness and sensitivity to the need for accessibility, even getting around Cambridge’s uneven brick sidewalks or in and out of its older buildings is still pretty difficult. “Harvard Square is one of the worst,” he said, noting that crossing the Yard or visiting Riew and You-Myeong Kim at Eliot and Kirkland Houses, respectively, is tough because of the narrow old doorways and steps. The ongoing House renewal program, under which renovations to Leverett House’s McKinlock Hall and Quincy House’s Stone Hall were recently completed, will bring full accessibility, including elevators, to all of Harvard’s historic undergraduate housing, said a University spokesman. Exhausted since returning to Harvard and jumping into a new semester, Kim said he’s happy the trip ended safely. And while the experience was certainly fun and exciting, just as he had hoped, it wasn’t without some trying times. The town of Lancaster will officially kick off October Accessibility Awareness Month from 10 a.m. to 4 p.m. Oct. 4 with an event on the Lancaster Town Green, coinciding with the popular Horseshed Fair. Accessibility Awareness Month was developed by the Lancaster Commission on Disability to create awareness and education surrounding the importance of accessibility for the disabled, whether physically seen or unseen, such as hearing, emotional and other less noticeable illnesses or conditions. 1 p.m.: Music on the Town Green with Lori Diamond and Fred Abatelli, funded by the Lancaster Cultural Council. 2 p.m.: Accessibility Walk with 20 States on Wheels. Throughout the day: information tables on disability/resources, state-of-the-art accessible van on display and safety and disaster response/support information from Lancaster EMT officials. Additional planned activities for Accessibility Awareness Month will include educational events, such as a presentation by the nurse carpenter of Solace RNovations at the Lancaster Public Library on Oct. 22, a month-long accessibility challenge to businesses and a ribbon cutting of a new elevator recently installed in the Lancaster Community Center. “Our commission has worked extensively on planning October Awareness Month, and we are excited for the kick-off event to mark the beginning of the month-long campaign,” said Michael McCue, chairman of the Lancaster Commission on Disability. Check out Kunho and Cynthia’s radio interview. A Business Administration student who will graduate from the University of Bath on Wednesday 2 July, is preparing for a road trip across the United States of America to create a coast-to-coast travel guide for wheelchair users. Cynthia Cheung will travel to 20 cities in 20 states in 50 days, with her friend, Kunho Kim, who was paralysed from the waist down after a skiing accident. The guide will review hotels, restaurants, museums and other attractions for wheelchair accessibility, and will be published by the Let’s Go travel series. Cynthia was born in Hong Kong and raised in the UK, and has a passion for travelling and social entrepreneurship. She met Kunho at the Igniting Innovation Summit 2013 and was inspired by his goal to improve travel information in the USA for wheelchair users. Cynthia, who was a student in the University’s School of Management, said: “My four years at Bath has not only enhanced my knowledge and skills, it has also provided me with invaluable opportunities to learn from big corporates and to think globally. Cynthia has also founded a start-up called Trafluence, which is empowering people to explore the world with their skills and influence. She has been selected by Google to take part in its Empowering Young Entrepreneurs programme. Cynthia, Kunho and two other team members will leave San Francisco on 11 July and aim to arrive in Boston on 28 August, visiting Los Angeles, Las Vegas, Denver, Kansas City, St. Louis, Chicago, Milwaukee, Detroit, Toronto, Buffalo, Cleveland, Pittsburgh, DC, Baltimore, Philadelphia, New York, New Haven and Providence. Kunho Kim remembers braving the chilly mountain air with friends on a ski trip in Montana in March 2010. They were taking turns snapping pictures of one another’s elaborate jumps and tricks. Except when Kim finished showing off for the camera — a jump where pictures show him rendered nearly upside down — he landed on his back, fracturing his spine. He was paralyzed from the waist down. 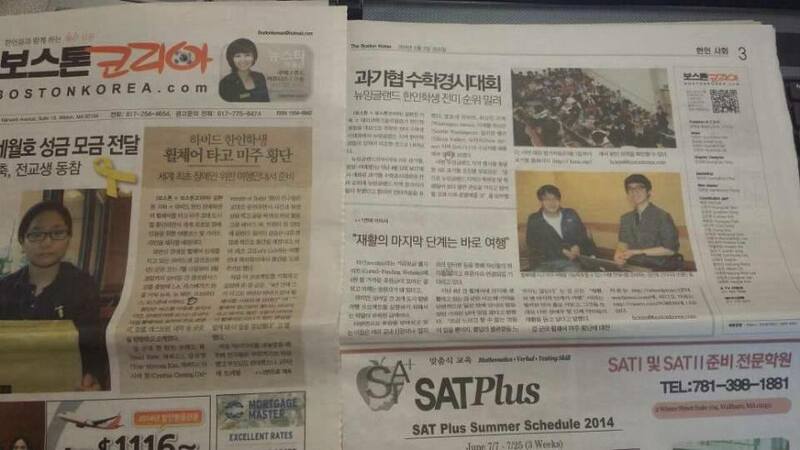 Now a sophomore at Harvard University, the South Korea native’s mobility has improved. His paralysis is limited to the waist down, and he’s just beginning to be able to move his legs voluntarily. However, the spinal cord injury has left him dependent on a wheelchair, for now at least. That has not stopped him. After his accident, Kim traveled frequently between South Korea and Vietnam for high school, took a year off before college to help disabled students travel around Seoul, and then flew halfway across the world to attend Harvard. This summer, Kim will take on one of the biggest travel challenges of his life. With three friends — including two classmates from Harvard — he will travel from Los Angeles to Boston in a wheelchair-accessible rental van, documenting the best and worst hotels, restaurants, and attractions in terms of accessibility, and then publish their findings. Let’s Go, the travel guide series written and edited entirely by Harvard students, will publish it online by the end of the year, Kim said. 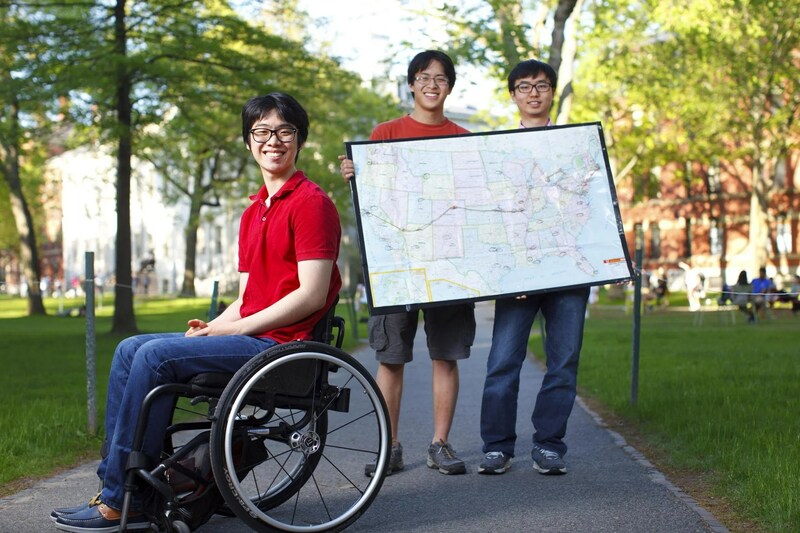 Harvard students (from left) Kunho Kim, Brad Riew, and You-Myeong Kim and a fourth friend, Cynthia Cheung, a student at the University of Bath, England, will drive from Boston to Los Angeles along the route they have plotted in a wheelchair accessible van that Kunho can drive. The foursome plans to take on 20 cities — including San Francisco, Los Angeles, Las Vegas, Chicago, Detroit, Philadelphia, and Washington — in less than two months. It’s an ambitious trip that Kim said he has been itching to complete. They will also keep a blog, updating it as they hop city to city. They will arrive back in Boston just days before the start of Harvard’s fall term. They hope to complete the book by the end of the year. “Plus, we’ll have a long car ride with nothing to do but this,” said Brad Riew, one of Kim’s classmates. “We’re hoping it’ll be a New York Times best-seller,” he jested. The main hurdle for the foursome — Kim, Riew, You-Myeong Kim, and Cynthia Cheung — is the price tag. The trip will cost, at the very least, $6,000 for the accessible van — which features hand controls so Kim can take his turn at the wheel — and gas. Kim said he expects it will cost about $15,000 total, after factoring in food, hotels, and activities. So far, the group has raised just over $6,000 through the crowd-funding site Trevolta, and has received a deeply discounted accessible van through Hertz, a $1,000 gift card for food from Cambridge’s H Mart, and some sponsored rooms from Hampton Inn hotels. Friends and family back in South Korea have also banded together to wire money to the United States — no easy feat, Kim said. The route the group will travel. But the group worries that the remaining $9,000 will be difficult to raise in the short period before they are set to leave on July 11.
Financing may prove the biggest challenge for now, but the mere thought of spending seven weeks with the same three people is enough to drive some people bonkers. Asked if he thought they would get sick of one another, Riew and Kim exchanged good-natured smiles and laughed. “It’ll be a bonding experience,” Riew said. Harvard College interim dean Donald Pfister mentioned Kim’s project in an April e-mail to students and staff. “I am constantly reminded that you all are already hard at work to make the world a better place. Please take a moment to view a project led by Kunho Kim ’17,” Pfister wrote, inserting a link to Kim’s Trevolta page. You can scour Harvard University’s online course catalog for as long as you want, but you won’t find a summer listing for Accessible Road Trips 101. That hasn’t stopped undergrad Kunho Kim from planning an elaborate 20-Cities on Wheels adventure where site-seeing will take a side seat to gathering information for an accessible online travel guide. Kim, who was raised in South Korea, was paralyzed in a skiing accident four years ago in Montana. The ambitious road trip will fulfill two of his passions: his desire to see more of America and his commitment to improving access. Kim will be traveling with three friends, including fellow Harvard undergrad Brad Riew. 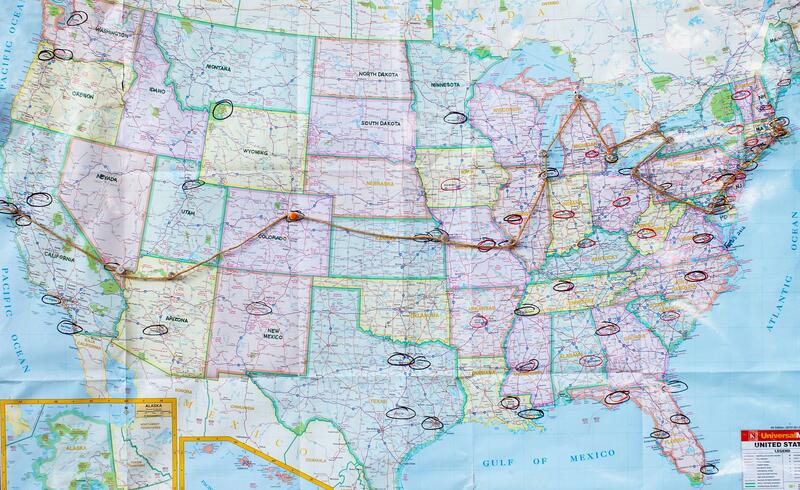 Their current route starts July 10 in San Francisco and ends 18 cities later Aug. 26 in Boston. They are hoping to spend one to three days in each city reviewing hotels, restaurants and attractions with an eye on wheelchair access. After the trip they will publish their travel guide through Let’s Go, a travel guide company run by Harvard students. They have been planning the trip for months and have raised nearly $6,000 via thecrowdfunding site Trevolta. Riew is optimistic the trip can make a difference in addition to being fun. Hometown: I was born in South Korea and have lived in Vietnam for the past eight years. So this summer my friends and I are going to do a road trip from San Francisco to Boston starting in early July and arriving in Boston on approximately August 20th, a couple of weeks before school starts. We’re gonna write a tour guide book for wheelchair accessibility; specifically, we’re going to write for Let’s Go, a Harvard tour guide book company. Which city are you most excited to visit and why? I’m actually excited about every city I’m going to go to. I’m just excited for the whole trip in general. The idea of going to different cities across the states is just fun. What was it like fundraising for your project? Have you reached your goal yet? What was the hardest part? So we’re actually $170 short from the goal. Our goal was $6,000 and we have about $5,800. In three or four weeks we’ve been able to raise this much so I’m really happy about it, but one of the most difficult parts was contacting people to ask for money. The project has meaning behind it, but also sometimes has the general feeling that they’re just paying for my trip. I had to learn how to phrase it to say that I’m actually going to make places more friendly to people in wheelchairs. Another part is that $6,000 is only the minimal cost to start the trip. We’ve actually estimated around $15,000. We’ve been able to get some sponsorships from Hertz and some other hotels, gratefully, so we think it should be alright, and also we’ve applied for grants through the Christopher Reeve foundation for which the results come out in June. We also got a lot of help from the FDO in terms of getting the word out and Dean Pfister sent an email out as a shout out. People around me helped a lot in terms of spreading the word. The video was one of the hardest parts, it took 2-3 weeks. What would you like Harvard students to learn from your project? I feel like a lot of Harvard students feel that when they want to do something, it has to be perfect and it has to be something really grandiose to even think about doing it. I feel like just having the guts to try it out, that spirit might be really helpful for people. I’ve met a lot of people with really awesome ideas, but they thought “Oh, it’s not going to work” or “It’s not practical enough”. So they didn’t start what they wanted to do. But if you don’t even start, how do you know if something is going to be good or bad? Even if you fail, at the end of the day you’ll learn something from the experience, and what really matters is the experience. As you plan for your own summer adventures, keep up to date with Kunho and his team at theWheel Project 2014 site! To learn more, you can also watch their promotional video. (서울=연합뉴스) 왕길환 기자 = 하버드대 한인 장애 학생이 휠체어를 타고 미주 대륙을 횡단할 수 있는 여행 가이드북을 집필하기 위해 실제 탐방에 나섰다. 주인공은 1학년에 재학하는 김건호 씨. 그는 오는 7월 11일부터 8월 28일까지 태평양 연안의 샌프란시스코를 LA, 라스베이거스 등을 거쳐 뉴욕, 뉴헤이븐, 프로비던스, 보스턴까지 휠체어를 타고 누빌 계획이다. 버스를 이용해 대륙을 횡단하지만 장애인 여행 코스는 직접 휠체어를 타고 답사해 주요 관광지, 호텔, 레스토랑, 대학 등을 소개한다. 김 씨의 여행에는 하버드대에 다니는 브래드 류·김유명 씨와 영국의 바스대에 재학하는 신시아 정 씨 등 3명의 친구가 동행한다. 이들은 교대로 운전하면서 사진과 동영상을 찍고, 관련 글을 바로 써 블로그, 페이스북, 트위터 등에 올릴 예정이다. SNS에 게시한 글들은 나중에 편집해 책으로 출간하겠다는 계획. 이미 ‘레츠 고'(Let’s Go)라는 여행 가이드북 출판사에서 출간을 돕기로 약속했다. 프로젝트를 기획하고 섭외한 김건호 씨는 4일 보스턴코리아와의 인터뷰에서 “4년 전에 스키 사고로 하반신이 마비돼 휠체어 신세를 지고 있다”며 “휠체어 접근성이 비교적 좋다는 미국도 아직은 휠체어로 다니기 어려운 현실이라는 사실을 알고 휠체어 여행 가이드북을 만들기로 결심했다”고 밝혔다. 사고 때 기억을 단편적으로 잃는 바람에 당시의 힘든 기억은 남아 있질 않다는 그는 “휠체어는 조금 느리고, 할 수 없는 것들이 있을 뿐이지 달리 불편함을 느끼지는 않았다”며 “재활의 마지막 단계가 여행이라는 말처럼 먼저 홀로 서보고, 그것을 토대로 다른 장애인 및 신체 약자들의 재활을 돕고 싶다”고 덧붙였다. 이 같은 그의 결심은 한때 반대에 부닥치기도 했다. 주변 친구와 부모가 위험하다며 부정적인 반응을 보였던 것. 그러나 2주 만에 ‘트레볼타'(Trevolta)라는 기금모금 웹사이트(크라우드 펀딩)에 6천 달러 정도의 후원금이 쌓이는 걸 확인하고 지금은 주위 사람들도 열렬한 응원자가 됐다고 한다. 김 군은 “50일 넘게 20개 도시를 탐방하려면 여전히 기금이 턱없이 부족한 상황”이라며 “많은 장애인이 휠체어를 타고 미국 여행을 할 수 있도록 도와달라”고 호소했다. 그의 휠체어 미주 횡단은 웹사이트(wheelproject2014. wordpress.com)와 비디오 자료(vimeo.com/91388395)에 소개돼 있다. 이들이 제작할 여행 가이드북은 세계 최초의 장애인을 위한 미국 여행 코스 안내 및 가이드 라인이 될 전망이다. (보스톤 = 보스톤코리아) 김현천 기자 = 하버드 한인 장애학생이 휠체어를 타고 미주 20개 도시를 횡단하면서 세계 최초로 장애인들을 위한 여행코스 및 가이드라인을 제시할 예정이다. 하반신 장애로 휠체어 신세를 지고 있는 하버드생 김건호(1학년) 군은 오는 7월 11일부터 8월 28일까지 50여일 간 샌프란시스코를 출발해 LA, 라스베가스 등을 거쳐 뉴욕, 뉴 헤븐, 프로비던스, 보스톤에 이른다. 횡단은 버스를 이용해 움직이지만, 장애인 여행 코스는 김 군이 직접 휠체어로 움직여 주요 관광지, 호텔, 레스토랑, 대학 등 곳곳을 탐방하고 소개한다. 김 군과 한 팀인 브래드 류(Brad Riew, 하버드), 김유명(You-Myeong Kim, 하버드), 신시아 정(Cynthia Cheung,University of Bath) 3명의 친구들은 교대로 운전하면서 사진과 동영상을 찍고 글을 써 바로 바로 블로그와 페이스 북, 트위터 등 SNS에 올린다. 올려진 글들은 나중 편집해 책으로 출간될 예정이다. 이미 레츠 고(Let’s Go)라는 여행 안내 책자회사에서 출간을 도와주기로 했다. 처음 이 프로젝트를 기획하고 섭외해 온 김 군은 “4년 전에 스키 사고로 하반신 마비가 되어 휠체어를 사용하게 되었다”며 “휠체어 접근성이 좋다는 미국이라고 하여도 많은 곳들이 아직까지 휠체어로 다니기 힘든 현실을 알게 돼 이 일을 결심했다”고 말했다. 처음 아이디어를 내놓았을 때 주변 친구들은 부정적으로 반응했고 부모님도 반대했으나, 2주만에 트레볼타(Trevolta)라는 기금모금 웹사이트(Corwd-Funding Website)에 6천 불 가까운 후원금이 모이는 걸 보고 이제는 응원자가 돼 있다고. 하지만, 50여일 간 20개 도시 탐방 여행 프로젝트를 실현하기 위해서는 턱없이 부족한 금액이다. 다방면으로 후원을 알아보고 있는 이들은 여러 교내 신문이나 잡지와의 인터뷰 등을 통해 자신들의 취지를 알리고 후원자와 연결되길 기다리고 있다. 지난 4년 간 휠체어에 의지해 생활하고 있는 김 군은 사고 때 기억을 단편적으로 잃은 탓에 당시의 힘들었던 기억은 남아 있질 않다고 밝혔다. “조금 느리고 할 수 없는 것들이 있을 뿐이지, 별달리 불편함을 느끼지는 않는다”는 김 군은 “재활의 맨 마지막 단계가 여행”이라는 말처럼 먼저 홀로 서보고, 그것을 토대로 다른 장애우 및 신체 약자들의 재활을 돕고 싶다고 말했다. https://wheelproject2014.wordpress.com, http://www.trevolta.com/travels/20-Cities-in-50-Days-in-a-Wheelchair-19878에, 비디오 자료는http://vimeo.com/91388395에 나와 있다.